His knowing smile and everyman disposition are instantly recognizable on screen. 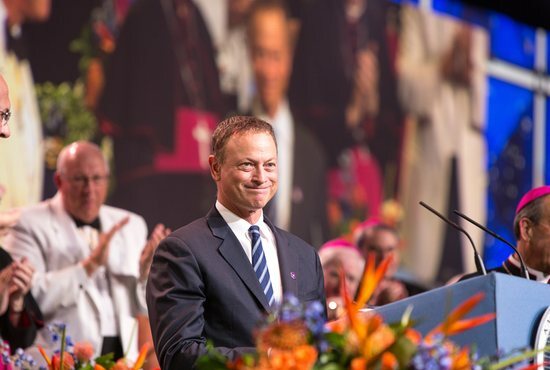 Those qualities were not lost on some 2,000 Knights of Columbus, their families and church leaders who were delighted by a surprise encounter with actor Gary Sinise during the fraternal organization’s Aug. 5-7 convention in Orlando. He spoke at the States Dinner Aug. 5 about his love for wounded veterans and a new collaboration between the Knights and his own charitable foundation. The Chicago native, a star of stage, film and television who is widely known for his portrayal of Lt. Dan in the 1994 movie “Forrest Gump,” also described his gradual move toward the Catholic faith and of his family’s decision to join the Church. Earlier this year, the Knights of Columbus partnered with the Gary Sinise Foundation to build a high-tech “smart home” for the disabled in Marietta, Ohio. The house was for a wounded veteran named Kyle Hockenberry and his wife, Ashley. The former U.S. Army infantryman was serving in Afghanistan and on foot patrol when he lost both legs and his left arm in a roadside explosion in June 2011. “When I think about the life and sufferings of Christ, when I think about the stories of the extreme hardships and heavy burdens that our military men and women and their families were willing to, and continue to bare, I can’t help but think about this verse: ‘For greater love hath no man than this, that he lay down his life for his friends,'” Sinise, 59, told the gathering. The smart-home collaboration between the Knights and the actor’s foundation is likely to be repeated because Sinise is attracted to the Knights’ depth of community ties nationwide and the organization’s standing commitments to the disabled, according to Peter Sonski, an education and outreach official with the Knights. Sinise traced the deepening of his own spirituality and faith in part to the events of Sept. 11, 2001, when he was invited, as a celebrity, to support first responders and later service men and women serving in Iraq. He noted the example of Franciscan Father Mychal Judge, a chaplain for the New York Fire Department who died helping victims in the aftermath of the terrorist attacks. “His simple prayer, ‘Lord, take me where you want me to go. Let me meet who you want me to meet. Tell me what you want me to say. And keep me out of your way, … is very special to my wife and I,” Sinise said. In the late 1990s, Sinise said his wife, Moira, was in Chicago performing in an Irish play set in a tavern when she started to reconnect with the Irish Catholic side of her family. Moira was not raised in a religious home but her mother was Catholic by birth and her father was Methodist, according to Sinise. Soon after, Sinise said his family was in North Carolina where he was working at the time, when a hurricane approached. “As we are racing down the highway in the rental car, trying to outrun the storm as lightning and wind and rain and thunder are chasing us … Moira, out of the blue, turns to me and says, ‘When we get back home I’m going to become a Catholic, and our kids are going to Catholic school,'” he said. After two years of classes, on Easter Sunday in 2000, Sinise’s wife was confirmed in the Catholic Church “and my children and I were there by her side. We were so proud of her and how far she had come,” he said. In 2010, on Christmas Eve, he told his wife and kids they were going out for a special dinner. Unbeknown to his family, he had been attending private sessions to be confirmed, he said. “The church has been a rock for me and my family in some of our darkest and most difficult times,” Sinise told the Knights. The Knights’ “incredibly generous and voluminous charitable work and mission” and the work of his foundation’s RISE program — Restoring Independence and Supporting Empowerment — seem made for one another in their efforts “to make a difference in the lives of our veterans,” he said. Sinise also performs with his Lt. Dan Band, entertaining the troops at home and abroad. He regularly travels to war zones to meet service members and visits U.S. military hospitals in Germany, San Antonio, San Diego and Bethesda, Maryland.